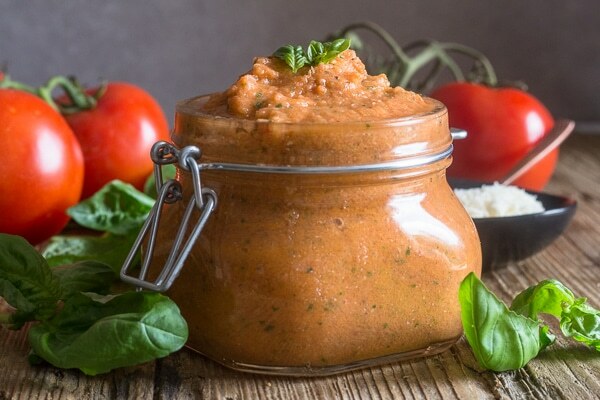 Creamy Tomato Pesto, this is a fast, easy and so delicious Tomato Pesto, made with fresh tomatoes, freshly grated Parmesan Cheese, and fresh spices. A delicious sauce without the addition of Cream. I have to admit since I arrived in Toronto almost 4 weeks ago I have never walked so much in my life. Since my daughter never renewed her monthly metro pass she constantly reminds me that there is no point in spending 3 dollars going one way, so let’s walk. She thinks why take the subway when everyone knows how good walking is for you?. Ok I agree but holy cow, I’m exhausted! And as hard as it is for me to admit this, she is right. And believe me this happens every time I return home! In order to really see a city, you have to walk to discover all the hidden streets and corners scattered around it. So carry on sore feet, we are building wonderful memories, especially this weekend with so much going on in this amazing and vibrant city. Between Pride week and Canada week my feet haven’t been still. Speaking of Canada week, we are celebrating Canada’s 147th birthday on July 1st, so I thought I would make something white and red in honour of this special day, and so I did. I decided to bring together my home country and my adopted country through this amazing new Pasta Recipe. 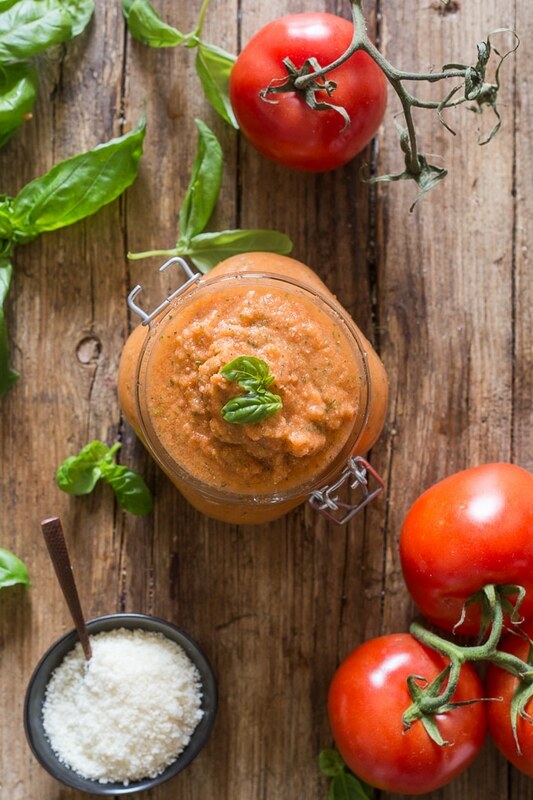 If you are a person that likes to try new things then this Tomato Pesto Pasta Recipe is a new and improved twist on the traditional pesto sauce. My sister was with me when I made this pasta and since she’s on a low-carb diet we decided to swap half the pasta with organic black bean spaghetti for her and Fettuccine for me and my daughter. Her verdict was a 10! 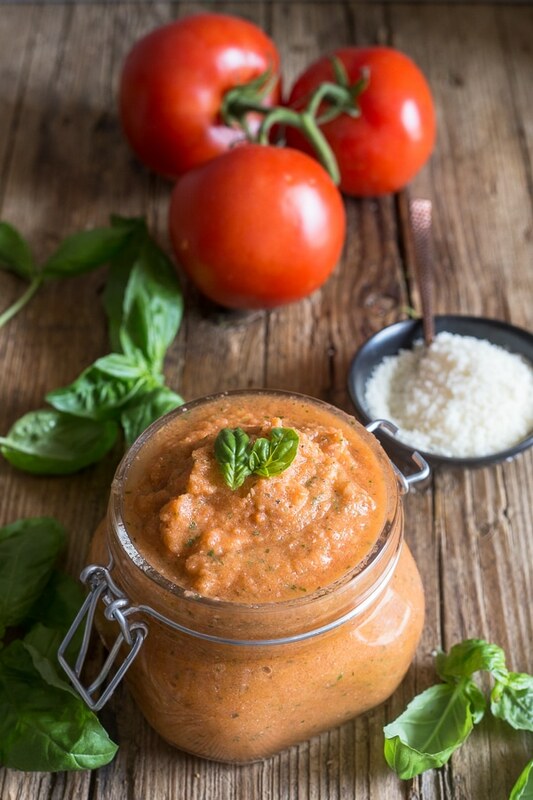 This Tomato Pesto Sauce was a hit among my family members, they cleaned their plates and couldn’t stop at a first serving! 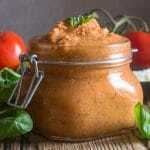 Since this first posting I have made this Fresh Tomato Pesto quite a few times both in Canada and Italy. It’s very easy and fast to make, so I suggest you get your blender out and start boiling some water! So Happy Almost Canada Day and Fourth of July! Buon Appetito! 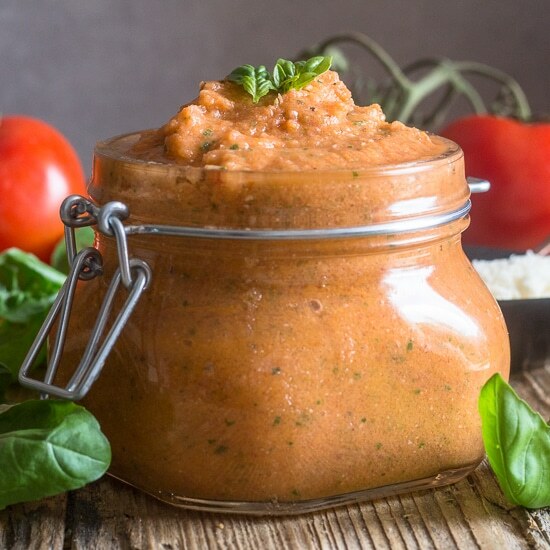 Creamy Tomato Pesto Fettuccine is a healthy, simple and easy pasta sauce recipe, creamy and delicious without the cream. Using either a blender, bullet or a food processor (I used a bullet only because that was what was available and it worked great) add all ingredients (you may have to add half the ingredients if there is not enough room in your machine) except the parmesan cheese. Blend until everything comes together, or until it reaches the desired texture (I left it a little on the chunky side, not creamy creamy). Makes approximately 1 3/4 cups enough for 2 meals of 3 cups of cooked pasta. Top with freshly grated parmesan cheese. Enjoy! This post was first published in June 2014, and since I believe it didn’t get the recognition is so deserves I am re-publishing it with new photos and a couple of up dates. Thanks! And since I will be heading home again soon to make lots of new memories! Hi Laura, I am sure you can freeze it, I freeze tomatoes and sauce. I make this in the summer. I grew up in Italy and this was one of my favorite summer dishes. I don’t use a recipe but yours is pretty similar to what I do. This is the first time I’ve ever seen it actually as a recipe on site! Reminds me of my childhood. Hi PK, I love bringing back memories, and it is one of our favourite ways to use up fresh tomatoes too. Have a great weekend. 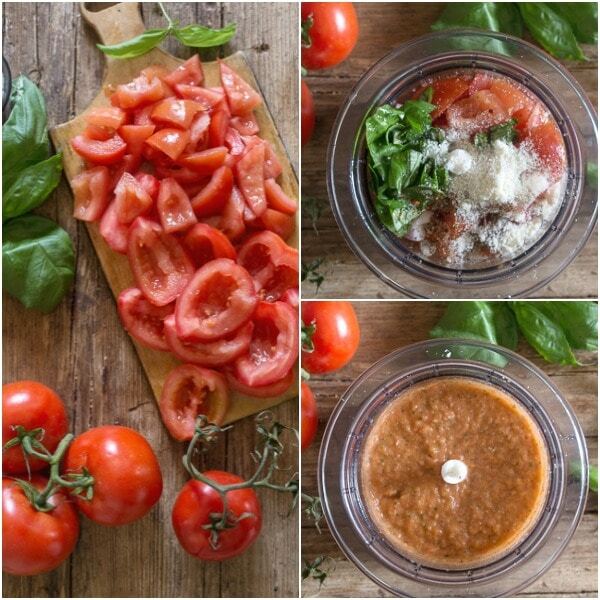 how much parmesan do you add to the tomato pesto recipe? Hi Donica, sorry about (has been corrected) 2-3 tablespoons of parmesan cheese. Hope you enjoy it. I want to try this recipe and I’m confused that I don’t see where it is cooked…Is it fresh and then just heated as you add it to the pasta? Hi Gay, yes you can just toss it with the hot al dente pasta which is what I do. Hope that helps. I just printed this recipe and am definitely making it. Just love the idea of no cream and very little oil. Thanks for another great recipe. Hi Ann, thanks so much hope you enjoy it. Have a wonderful weekend. That looks so yummy. I love recipes that let me use up garden goodies. Pinning to Creative K Kids Tasty Tuesdays board. Thanks for pinning up this week. Hi Dina, thank you hope you enjoy it. Hi Katherine, thanks again. Have a great weekend.